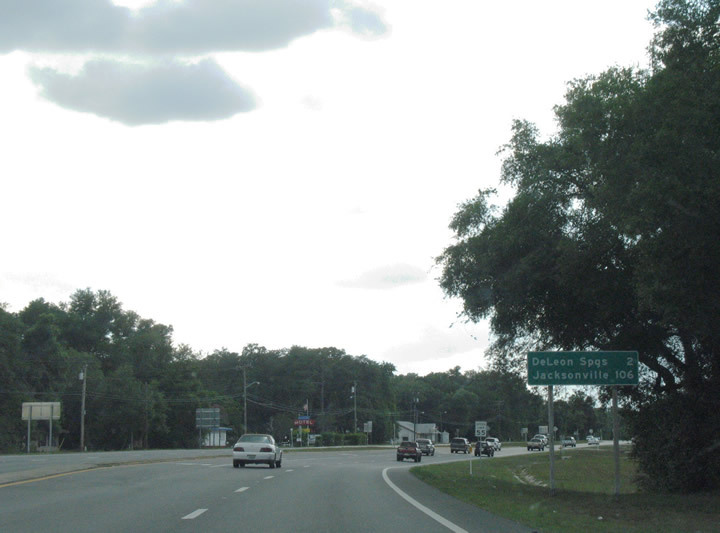 U.S. 17 (Woodland Boulevard) north leaves U.S. 92 east through north DeLand. 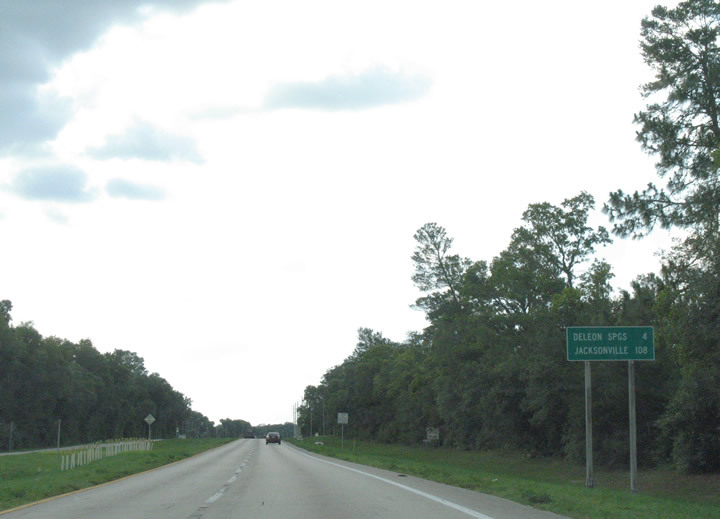 A short distance separates the split with Florida 11 (Perkins Highway). Photo taken 03/21/08. 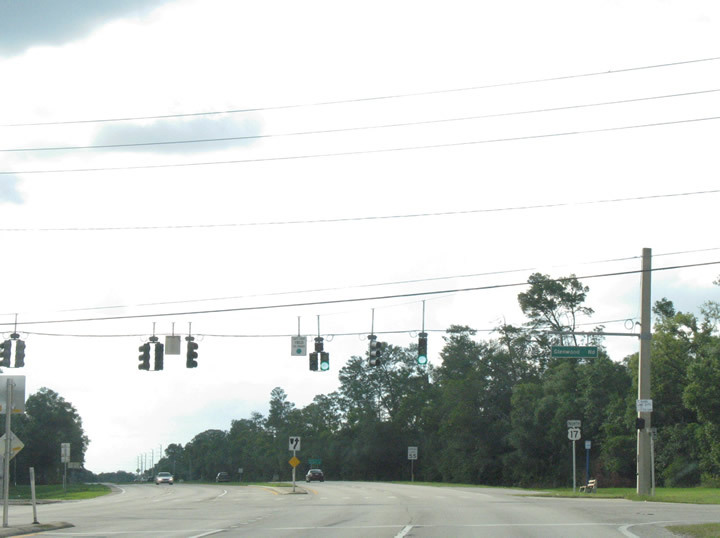 Nearing the junction with Florida 11's south end and unsigned Volusia County 4088 (Glenwood Road) west. Photo taken 03/21/08. 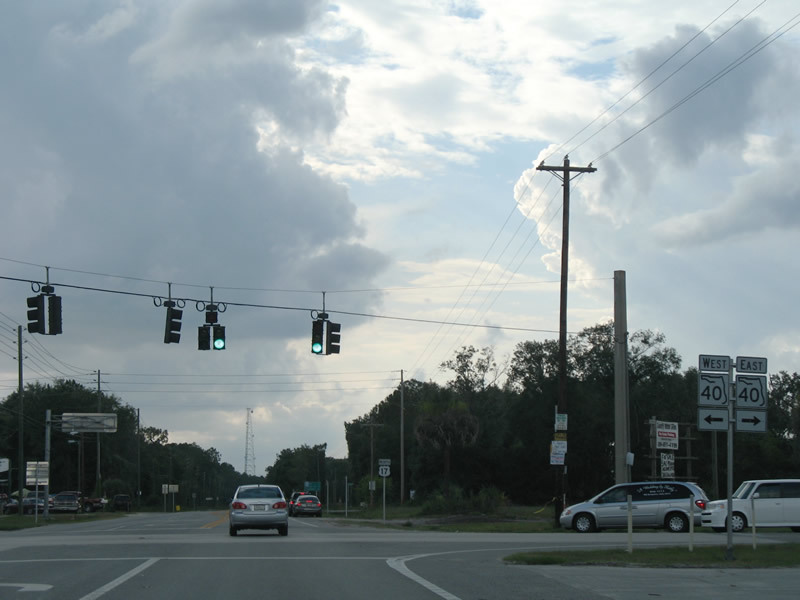 Drivers departing for Florida 11 (Perkins Highway) north split with U.S. 17 north ahead of the signalized intersection with unsigned Volusia County 4088 (Glenwood Road). Florida 11 ventures northward from DeLand to Bunnell; Glenwood Road stems west to Volusia County 4053 (Grand Avenue) at Glenwood. Photo taken 03/21/08. 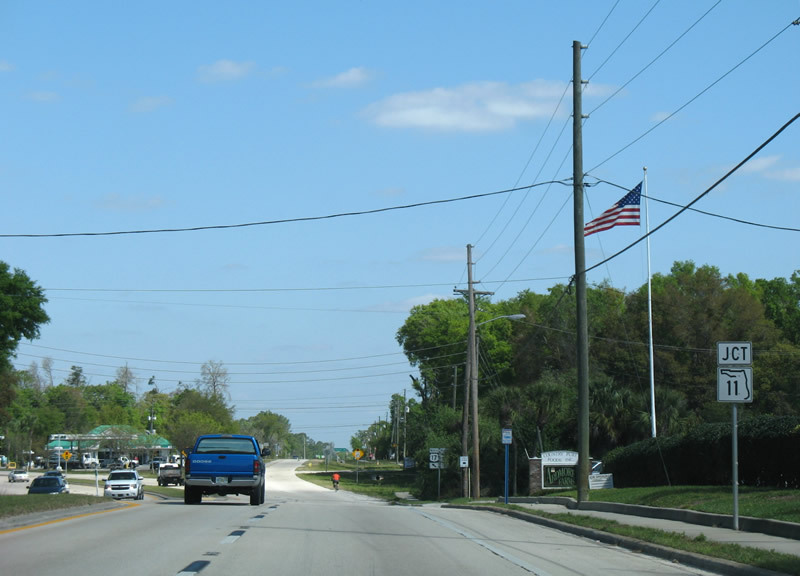 Glenwood Road (unsigned Volusia County 4088) leads west from U.S. 17 (Woodland Boulevard) to Volusia County 4053 (Grand Avenue) at the Glenwood community. Photos taken 06/12/08. 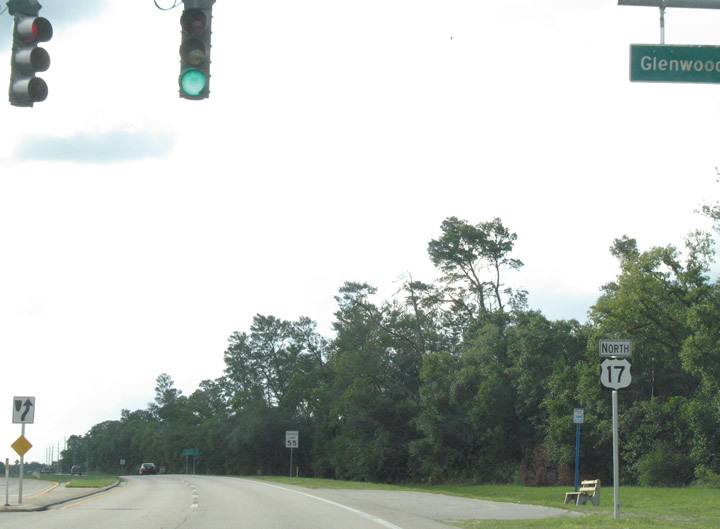 U.S. 17 next reaches DeLeon Springs in four miles on the 108-mile drive to Jacksonville. Photo taken 06/12/08. 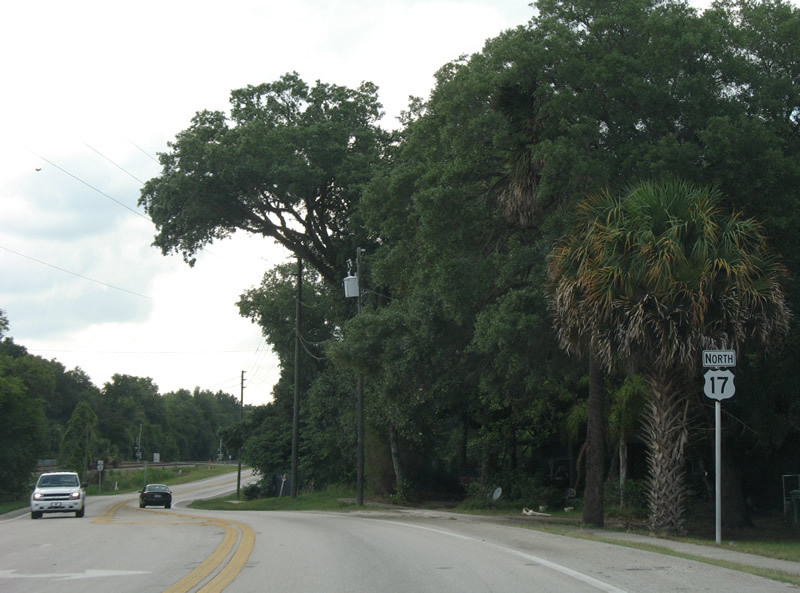 Approaching Florida 15A (Spring Garden Avenue) south and Volusia County 15A north. 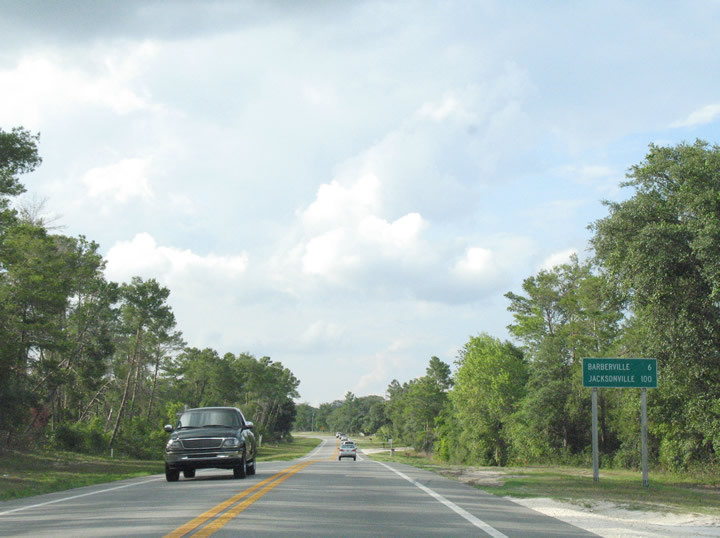 Florida 15A represents the through-route for trucks around DeLand for interests from DeBary southward. Volusia County 15A continues the route east to Florida 11 for interests north to Bunnell. Photo taken 06/12/08. 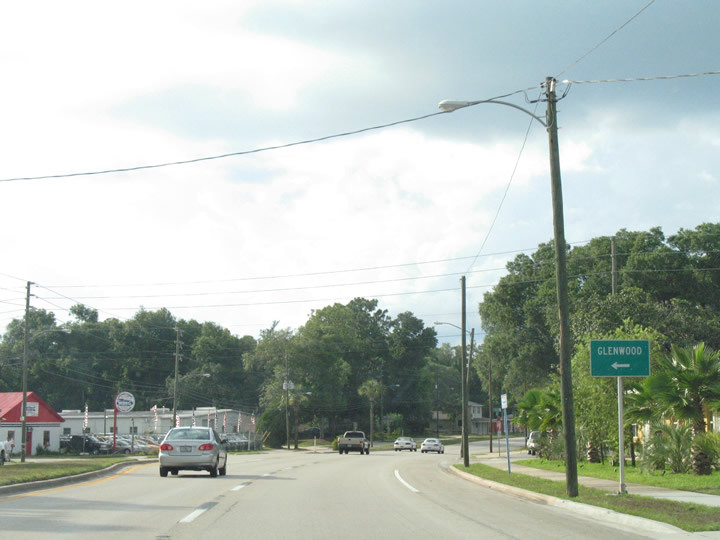 Florida 15A (Spring Garden Avenue) carries four overall lanes southward through west DeLand. Volusia County 15A downgrades to two lanes to its end at Florida 11 near Lake Daugharty. Photo taken 06/12/08. 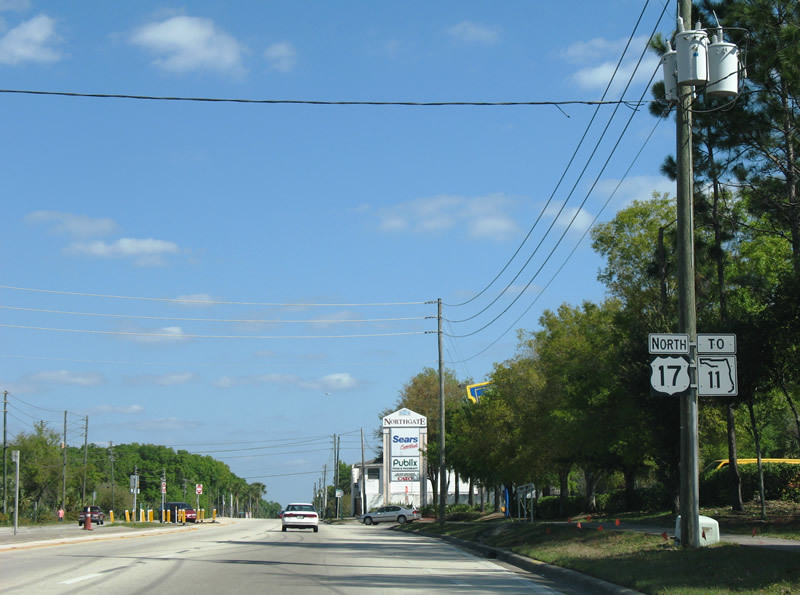 U.S. 17 continues with four lanes northwest from Florida 15A to DeLeon Springs. Photos taken 06/12/08. Volusia County 4053 (Grand Avenue) stems north from Florida 44 west of Deland through Glenwood to Wheeler Street in DeLeon Springs. Photo taken 06/12/08. 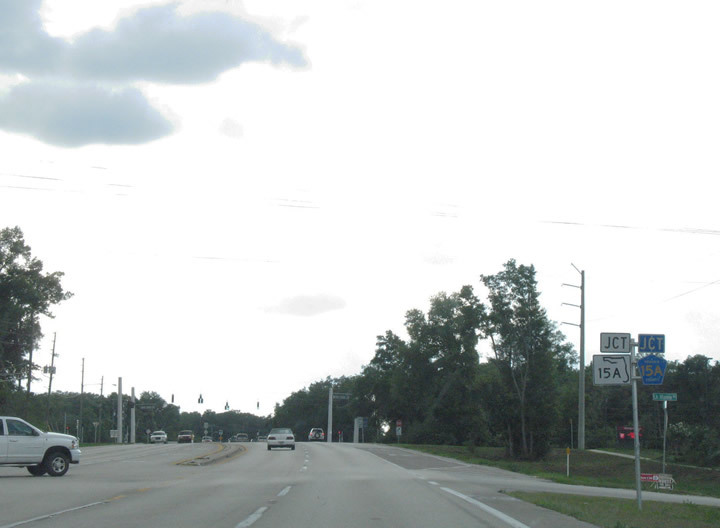 Northbound U.S. 17 at Volusia County 4053 (Wheeler Street) south in DeLeon Springs. 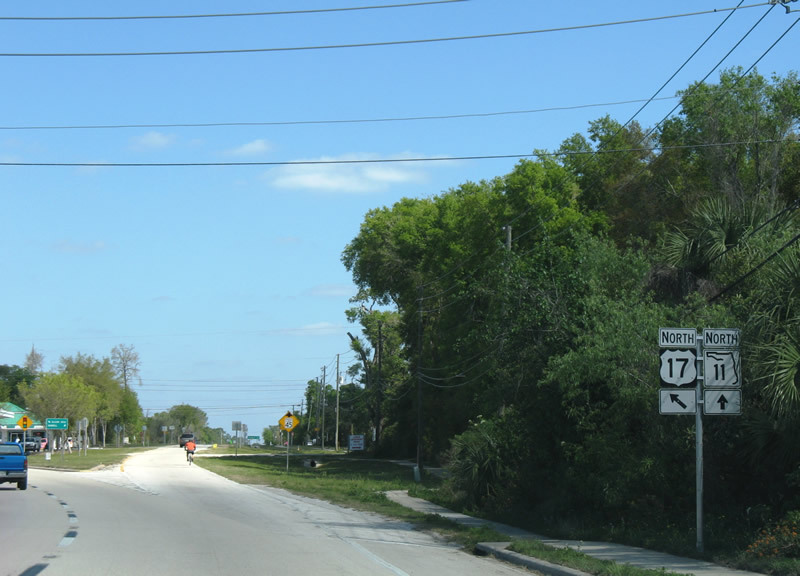 The partially-signed route travels 6.61 miles south to Florida 44. Photo taken 06/12/08. 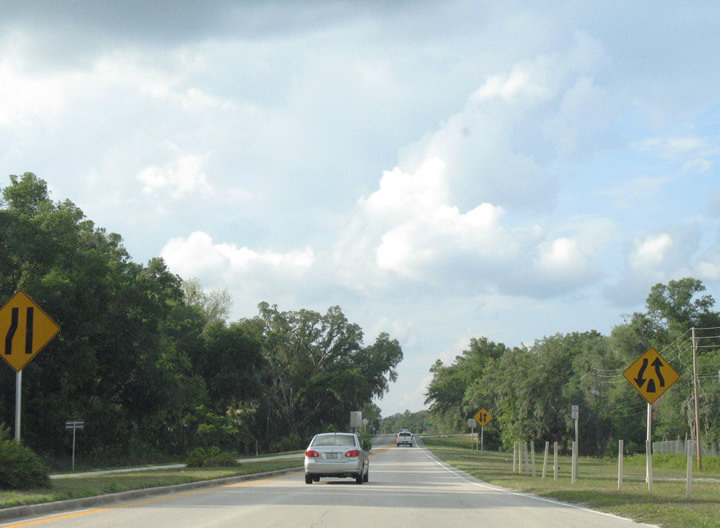 Continuing north through DeLeon Springs along U.S. 17. Photo taken 06/12/08. 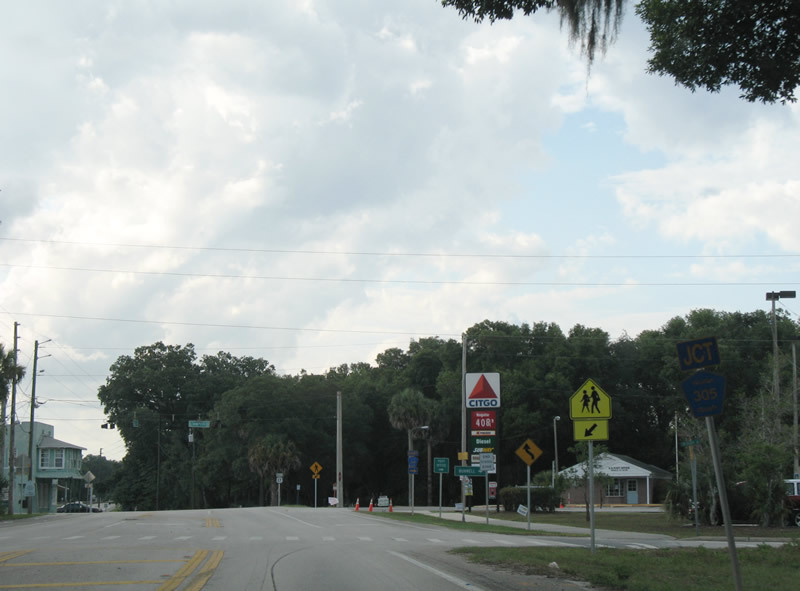 U.S. 17 reverts to a two-lane roadway for the first time since the shores of Lake Monroe in Sanford in north DeLeon Springs. Photo taken 06/12/08. 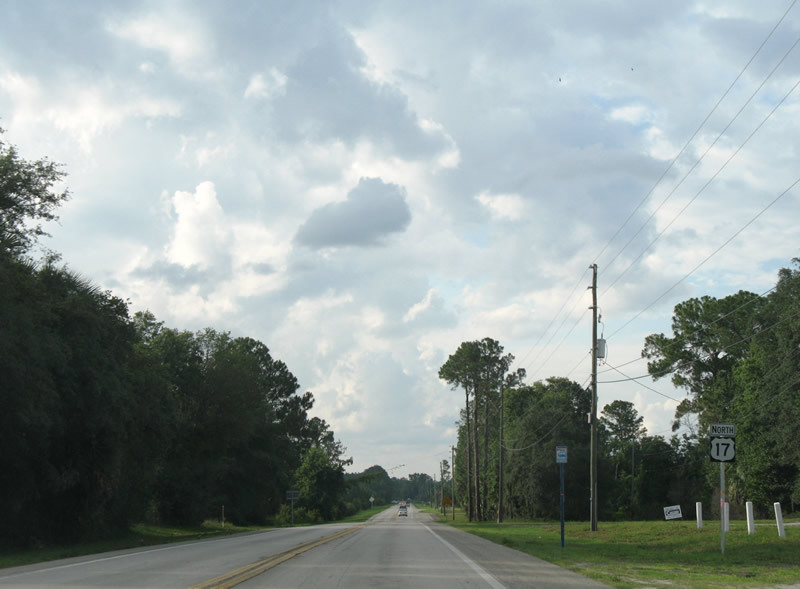 Now rural in nature, U.S. 17 continues six miles to Barberville. Photo taken 06/12/08. 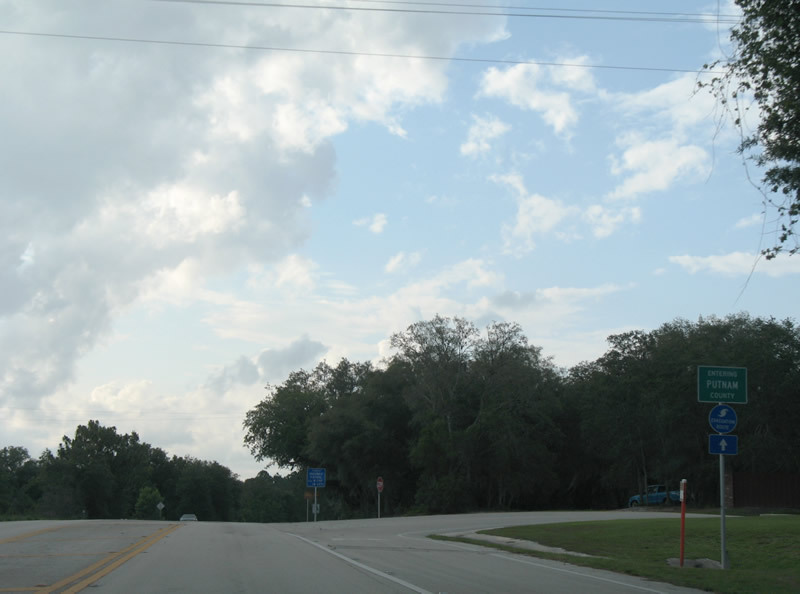 Volusia County 4023 (Lake Winona Road) crosses paths with U.S. 17 outside of DeLeon Springs. 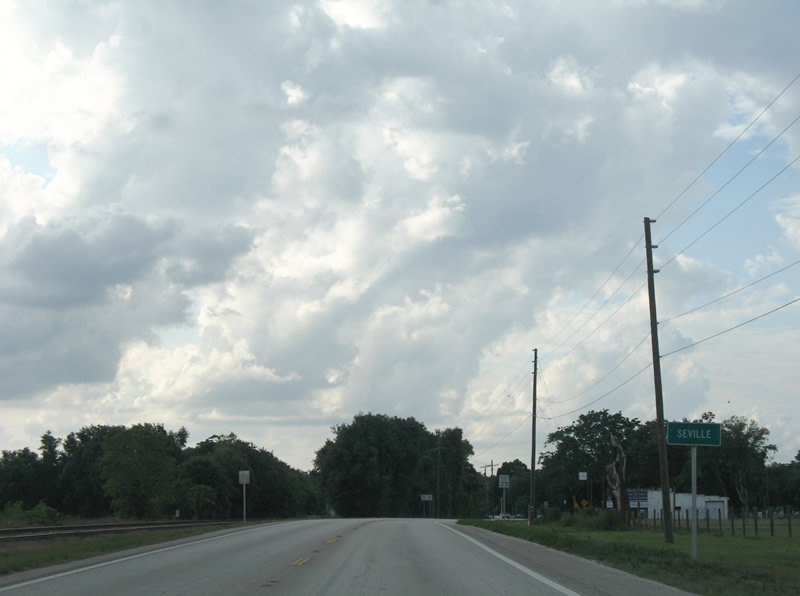 The unsigned county road travels Lake Winona Road north from DeLeon Springs State Park to Camp Winona and Florida 40. Photo taken 06/12/08. U.S. 17 continues northwest along side a railroad line (out of view) toward Pierson. Photo taken 06/12/08. 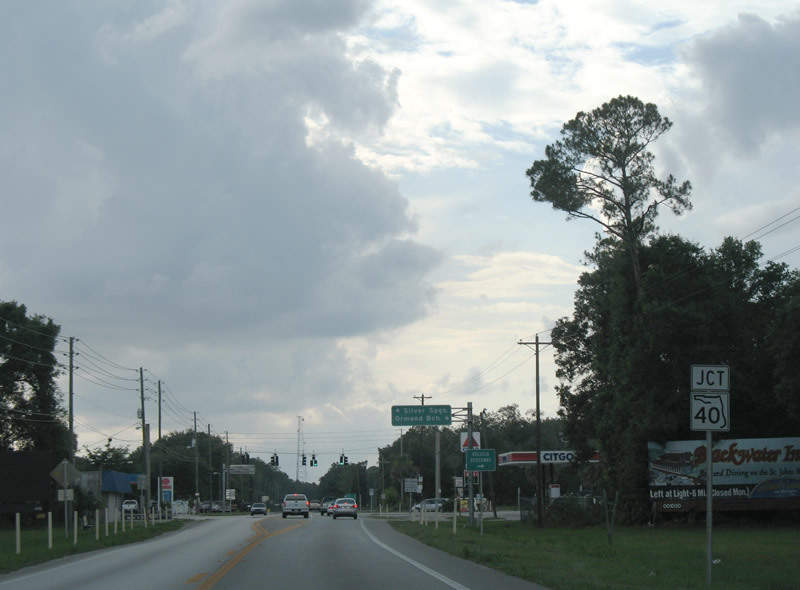 Entering the settlement of Barberville on U.S. 17 north. Photo taken 06/12/08. 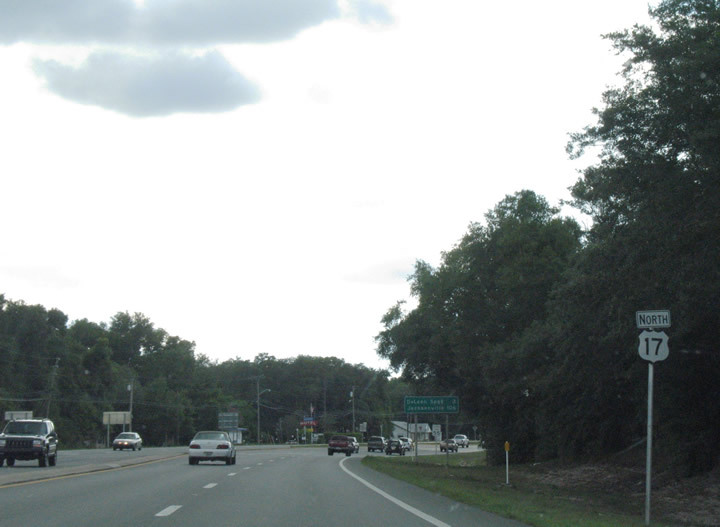 Florida 40 represents an almost cross-peninsular route between Ormond Beach and U.S. 41 north of Dunnellon. Photo taken 06/12/08. 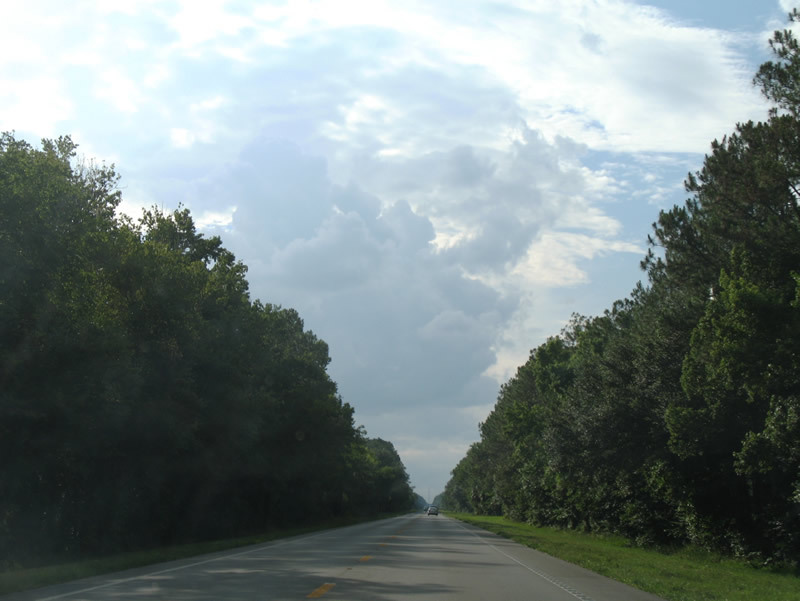 Florida 40 travels a rural path west across Ocala National Forest to Silver Springs and east to Florida 11 and Interstate 95 in western Ormond Beach. Photo taken 06/12/08. 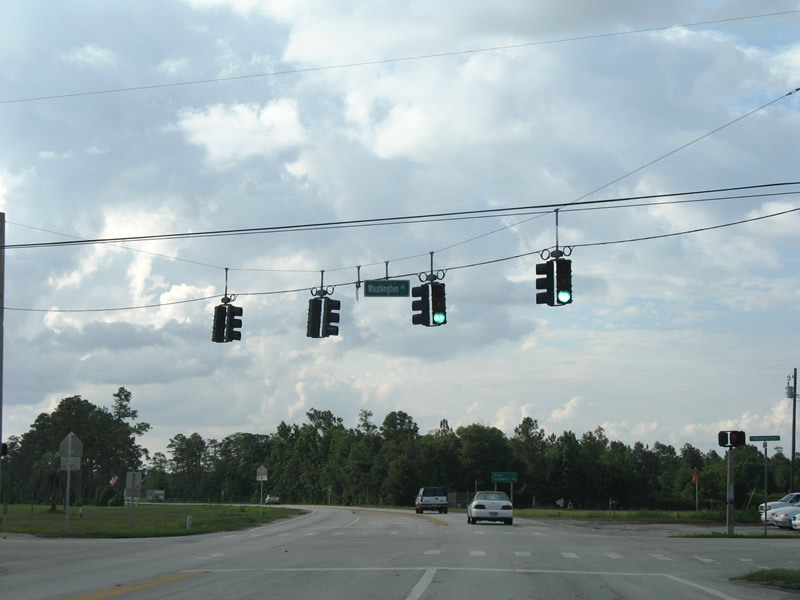 The last traffic light in Volusia County regulates U.S. 17 traffic movements at Florida 40. Photo taken 06/12/08. 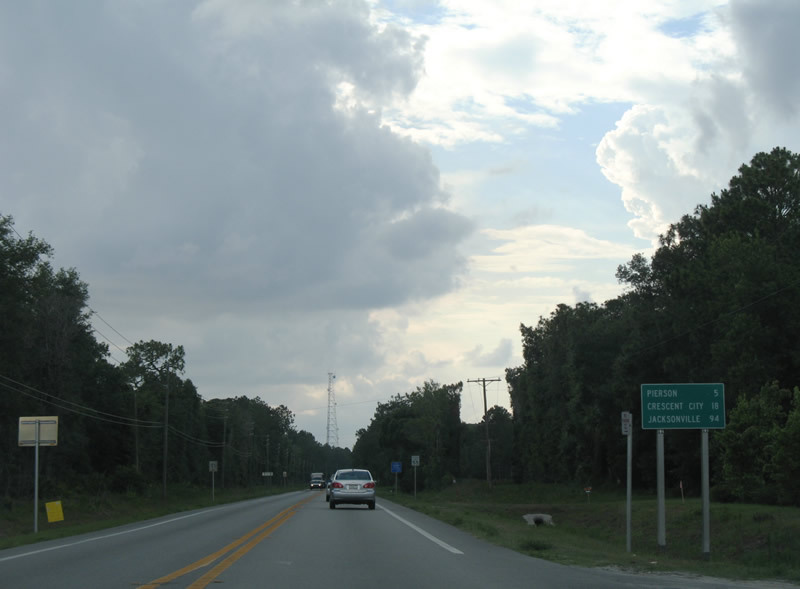 U.S. 17 leaves Florida 40 and Barberville for Pierson. Photos taken 06/12/08. 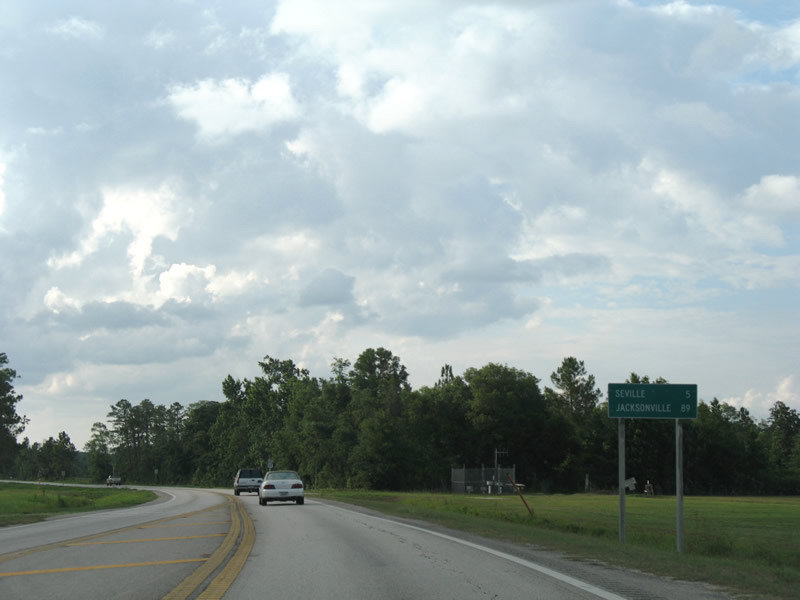 Pierson is an incorporated rural community in northwest Volusia County with a population around 2,600. Photo taken 06/12/08. 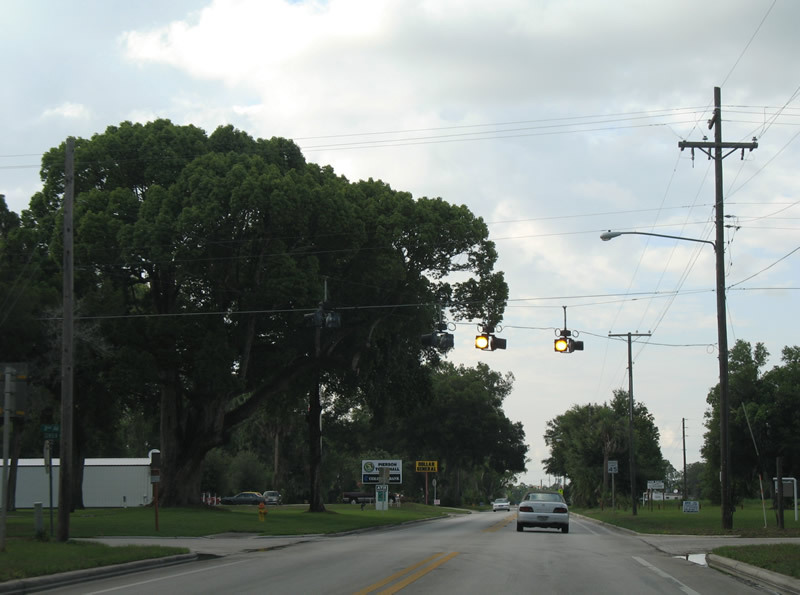 The first of two sets of flashers hang above the U.S. 17 (Center Street) intersection with 2nd Avenue in Pierson. Photo taken 06/12/08. 1st Avenue and U.S. 17 intersect at the second set of flashers in Pierson. 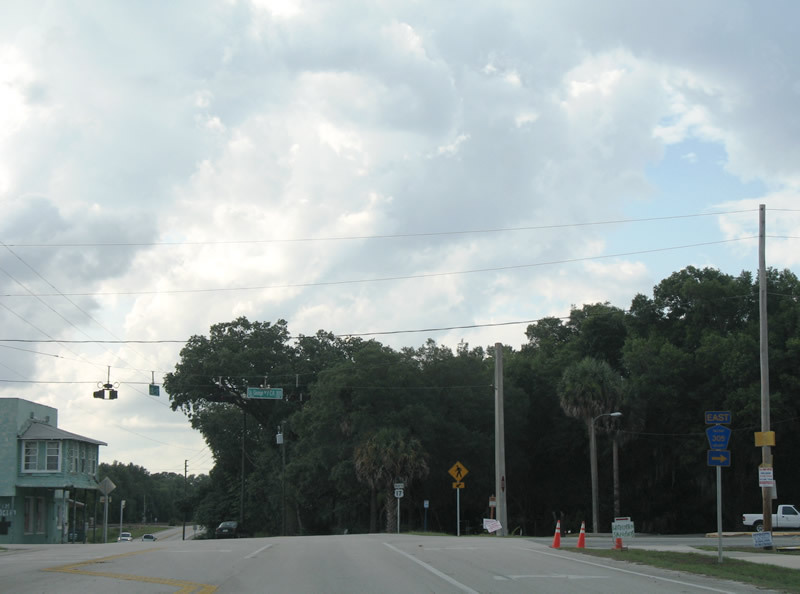 Both roads travel short distances west to Volusia Avenue (Volusia County 2825) and Frederick Street. Photo taken 06/12/08. 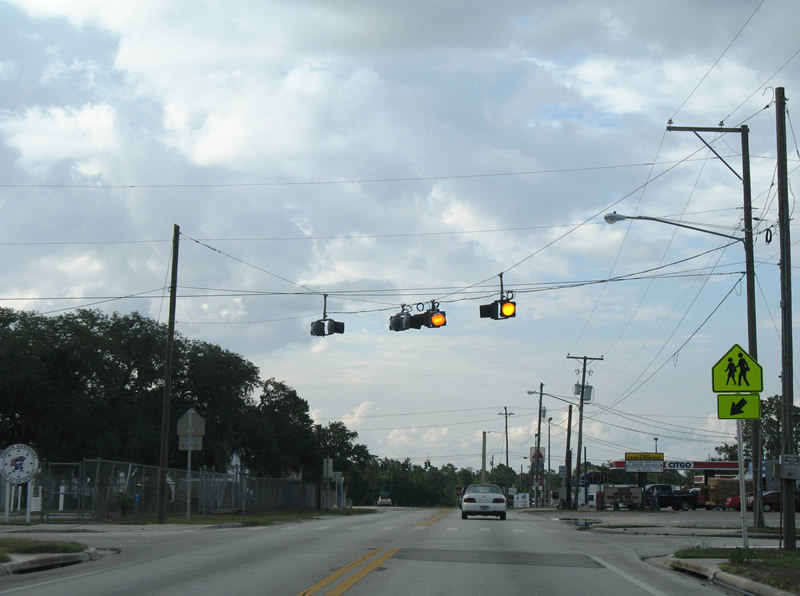 Pierson's only traffic light resides at U.S. 17 (Center Street) and Washington Avenue. 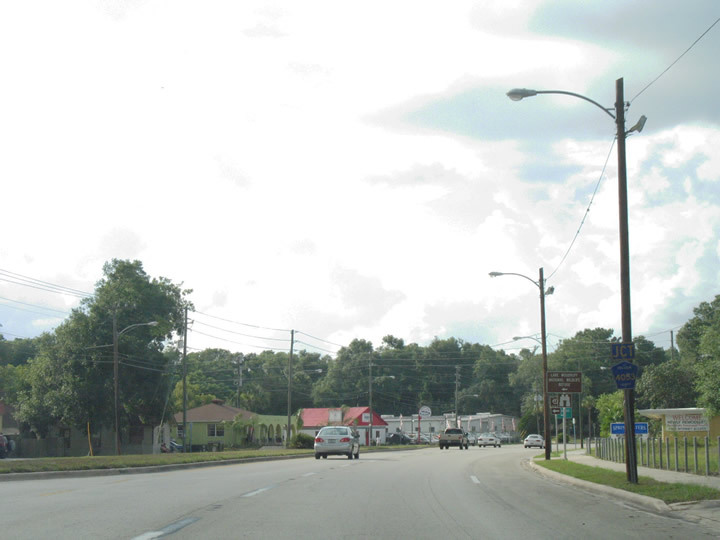 Washington Avenue leads west to Braddock Road and east all the way to Lake Disston. Photo taken 06/12/08. 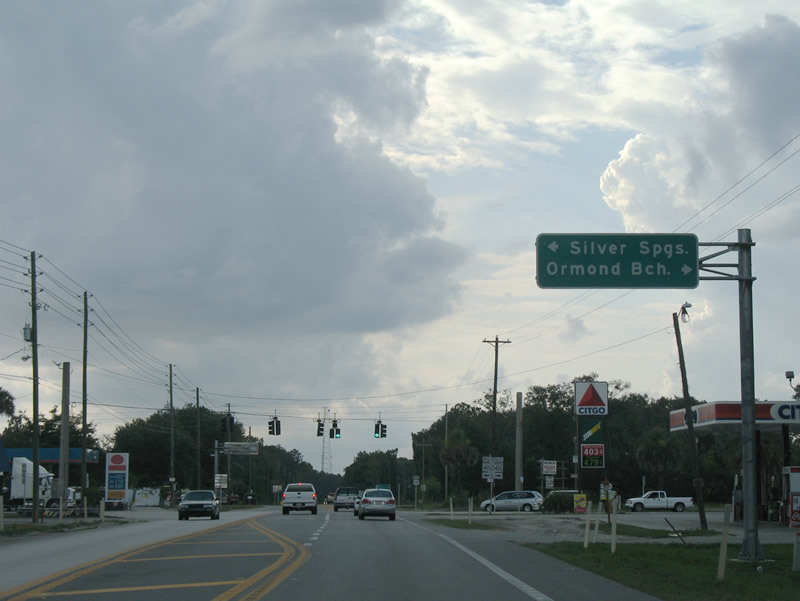 Five miles separate the outskirts of Pierson with Volusia County 305 at Seville. Photos taken 06/12/08. 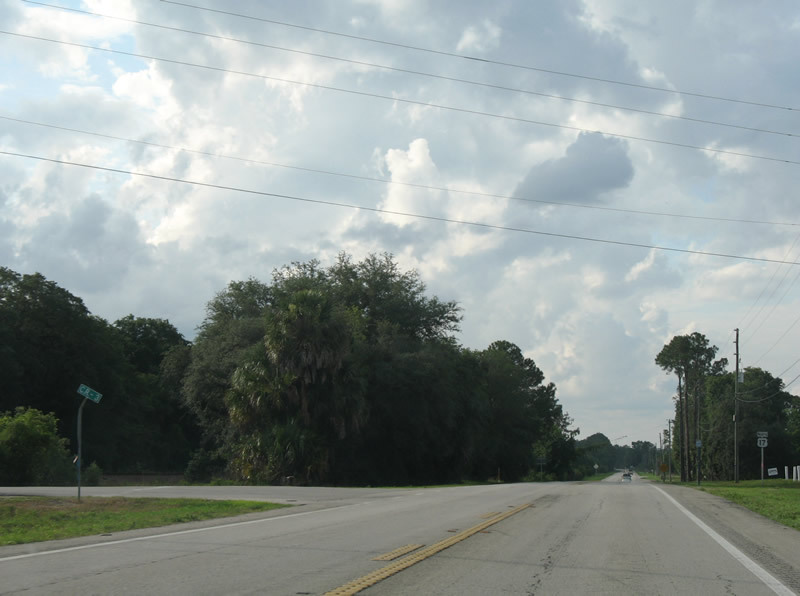 Signed as County Road 3, Volusia County 2825 (unsigned) follows the old U.S. 17 southward through Pierson along the west side of the parallel railroad tracks. The former road merges with the newer U.S. 17 at Connersville. Photo taken 06/12/08. 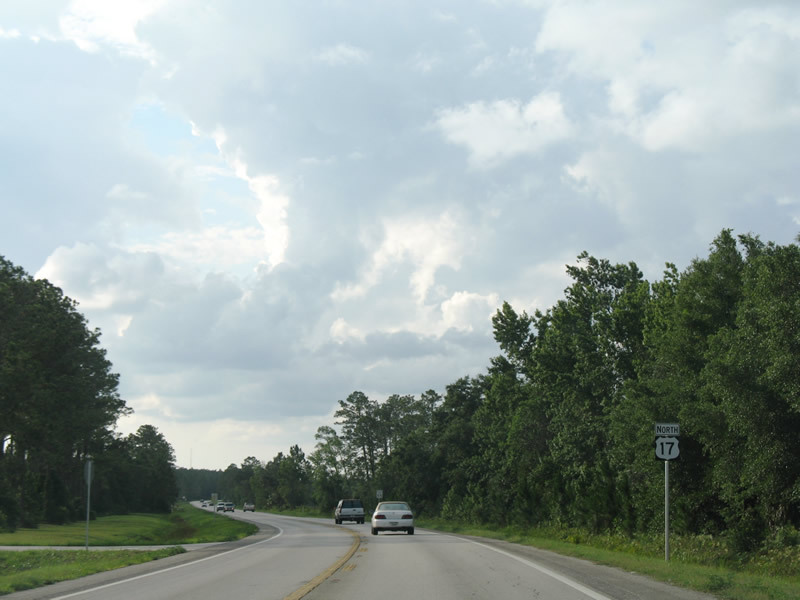 U.S. 17 bee lines northward to Seville from the County Road 3 merge. Photo taken 06/12/08. 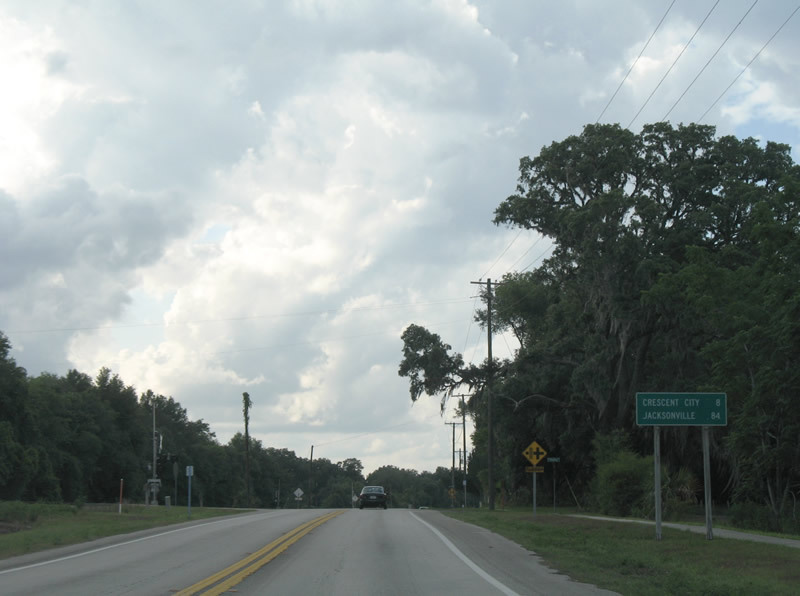 Seville is an unincorporated community in northwest Volusia County. Photo taken 06/12/08. 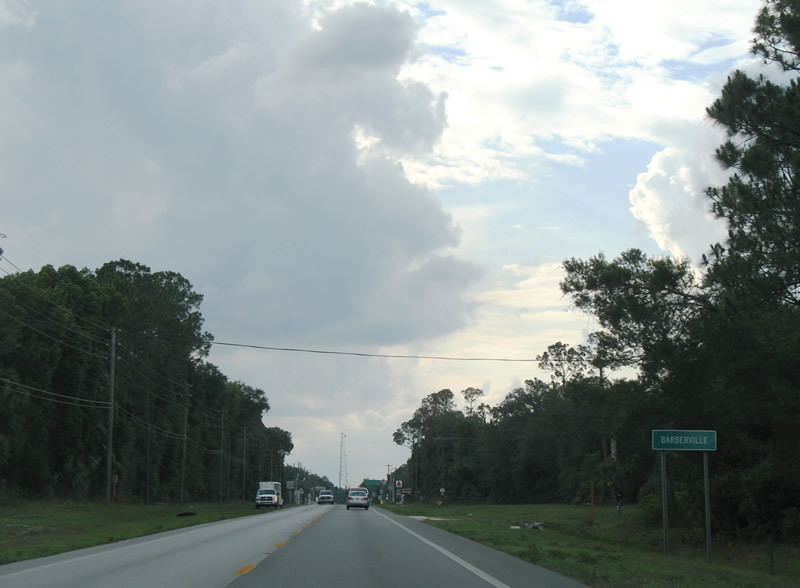 Volusia County 305 travels 8.46 miles from the Flagler County line west to Lake George. The section west of Seville is unsigned. Photo taken 06/12/08. 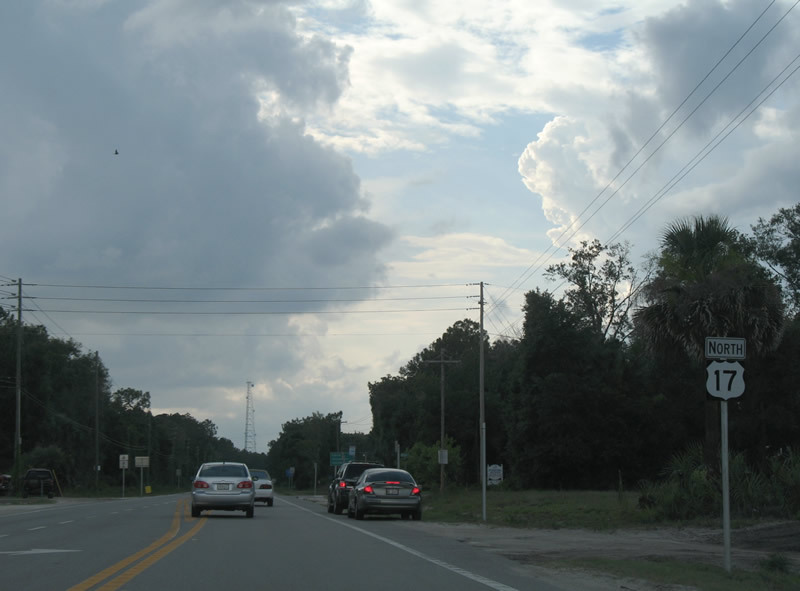 U.S. 17 north at Volusia County 305 east to rural west Flagler County. 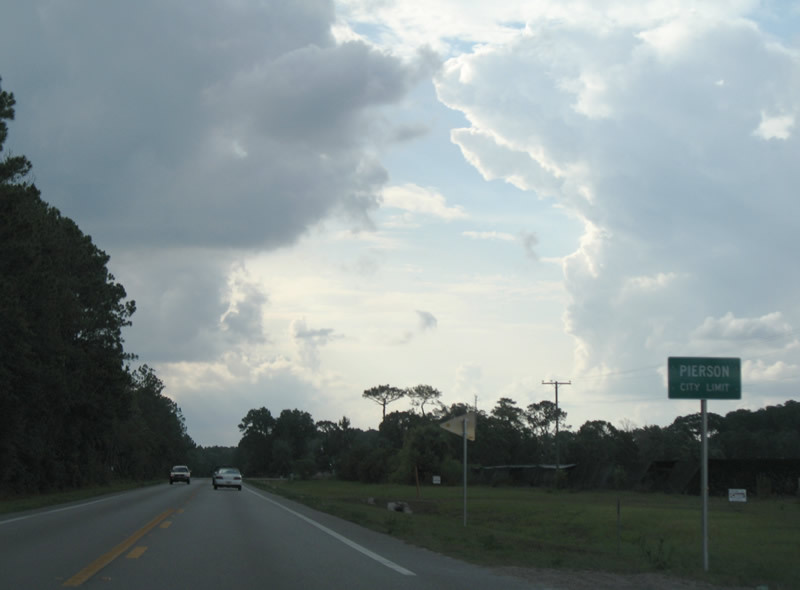 Flagler County 305 turns northward to Florida 100 west of Bunnell, 20 miles from Seville. Photo taken 06/12/08. Leaving Seville along U.S. 17 north; Crescent City lies 11 miles ahead. Photos taken 06/12/08. 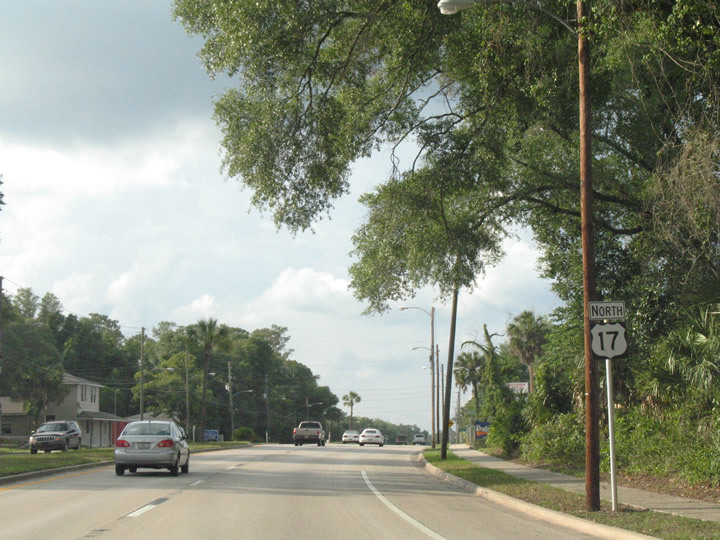 U.S. 17 departs Volusia County for Putnam County near the settlement of Hammond. Photo taken 06/12/08. Page Updated September 30, 2008.